﻿ Fun Easy English - Environment - Global warming - Climate change Indicators: Drought. During the latter half of 2012, more than half of the U.S. land area was covered by moderate or greater drought (see Figure 2). In several states, 2012 was among the driest years on record. See Temperature and Drought in the Southwest for a closer look at recent drought conditions in one of the hardest-hit regions. As average temperatures have risen because of climate change, the Earth’s water cycle has sped up through an increase in the rate of evaporation. An increase in evaporation makes more water available in the air for precipitation, but contributes to drying over some land areas, leaving less moisture in the soil. Thus, as the climate continues to change, many areas are likely to experience increased precipitation (see the U.S. and Global Precipitation indicator) and increased risk of flooding (see the Heavy Precipitation indicator), while areas located far from storm tracks are likely to experience less precipitation and increased risk of drought. As a result, since the 1950s, some regions of the world have experienced longer and more intense droughts, particularly in southern Europe and West Africa, while other regions have seen droughts become less frequent, less intense, or shorter (for example, in central North America). 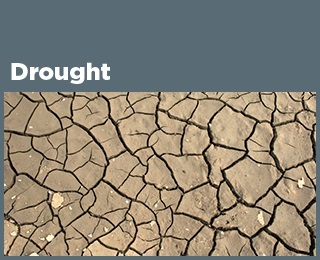 Drought conditions can negatively affect agriculture, water supplies, energy production, and many other aspects of society. The impacts vary depending on the type, location, intensity, and duration of the drought. For example, effects on agriculture can range from slowed plant growth to severe crop losses, while water supply impacts can range from lowered reservoir levels and dried-up streams to major water shortages. Prolonged droughts pose a particular threat to indigenous populations because of their economic and cultural dependence on land and water supplies. Warming and drought can threaten medicinal and culturally important plants and animals and can reduce water quality and availability, making tribal populations particularly vulnerable to waterborne illnesses. Lower streamflow and groundwater levels can also harm plants and animals, and dried-out vegetation increases the risk of wildfires. During the 20th century, many indices were created to measure drought severity by looking at precipitation, soil moisture, stream flow, vegetation health, and other variables. 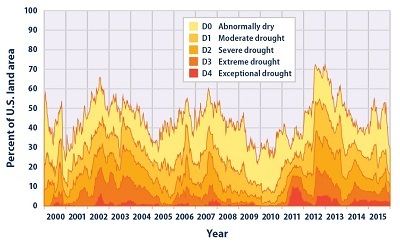 Figure 1 shows annual values of the most widely used index, the Palmer Drought Severity Index, which is calculated from precipitation and temperature measurements at weather stations. An index value of zero represents the average moisture conditions observed between 1931 and 1990 at a given location. A positive value means conditions are wetter than average, while a negative value is drier than average. Index values from locations across the contiguous 48 states have been averaged together to produce the national values shown in Figure 1. 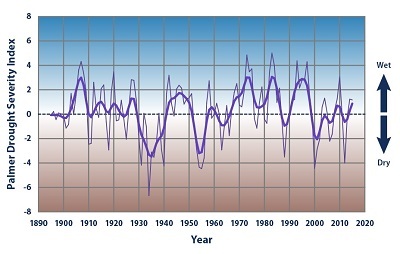 Data for Figure 1 were obtained from the National Oceanic and Atmospheric Administration’s National Centers for Environmental Information, which maintains a large collection of climate data online at: http://www7.ncdc.noaa.gov/CDO/CDODivisionalSelect.jsp. Data for Figure 2 were provided by the National Drought Mitigation Center. Historical data in table form are available at: http://droughtmonitor.unl.edu/MapsAndData.aspx.